DALLAS—The Dallas Opera, in partnership with AT&T Stadium and with support from our founding sponsor, The Dallas Foundation, is extremely proud to announce the company’s fifth stadium simulcast. This program has reached more than 63,000 people since the first free public presentation in 2010. The simulcast of the legendary 1927 American Musical, SHOW BOAT, conducted by Dallas Opera Music Director Emmanuel Villaume, is scheduled to take place on Saturday, April 23, 2016 at AT&T Stadium in Arlington, TX (home of the Dallas Cowboys). Doors will open at 6:00 p.m. Curtain time for that evening’s live performance of this critically acclaimed production of a twentieth-century musical theater masterpiece is 7:30 p.m.
Free parking is available, starting at 5:00 p.m. in lots 1, 2, 3 and 10. Enter through gates A and K on the north side of the stadium. There is no reserved parking. The simulcast will be hosted by local radio personality Jody Dean with able assistance from co-host Kristian Roberts, Dallas Opera Education Program Senior Manager. Although the cartoon was produced in 1995, it is actually a prequel (and tribute) to the 1955 classic “One Froggy Evening,” created by Michael Maltese and Chuck Jones. As you might expect, the prequel explores the curious origins of the cartoon character Michigan J. Frog. Stadium guests will then experience a groundbreaking work from the American Musical canon, based on the novel by Edna Ferber. Composed by Jerome Kern with book and lyrics by Oscar Hammerstein II, SHOW BOAT courageously addressed some of the most contentious social issues of the day within the context of a beautifully told story of a bittersweet, lifelong romance. The American Musical would never be the same again. Based on the novel by Edna Ferber, SHOW BOAT is the source of many memorable musical numbers including “Make Believe,” “Can’t Help Lovin’ Dat Man” and “Ol’ Man River.” The landmark musical also tackled such taboo subjects as racism, alcohol addiction and miscegenation on this journey through several transformative decades of American life. This brilliant Francesca Zambello production of SHOW BOAT, created for Lyric Opera of Chicago, carries us down the Mississippi, through love’s choppy waters, as life rolls on for Magnolia and the gambling man she adores. 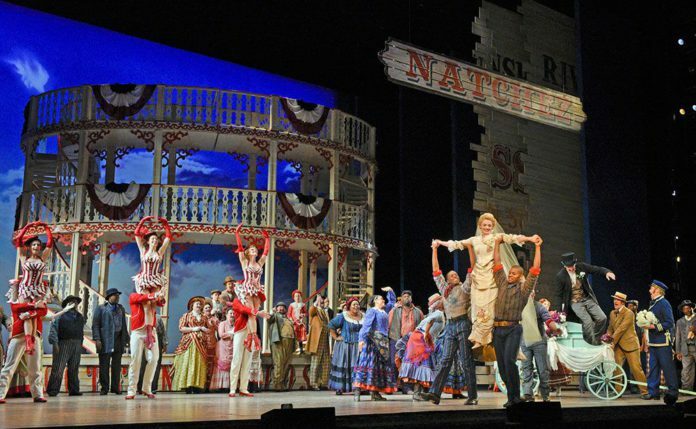 Patrons will be able to enjoy the SHOW BOAT simulcast, live from the Shannon and Ted Skokos Stage in the Winspear Opera House at the AT&T Performing Arts Center in Dallas, on the world’s largest high-definition video board structure suspended directly above the playing field. This performance will take place as part of The Dallas Opera’s nationally recognized, free public simulcast program, which has attracted more than 60,000 patrons over the past five years. Thousands more are expected to attend next April. “The Dallas Foundation has been pleased to support The Dallas Opera’s simulcasts to AT&T Stadium since 2012, helping to provide families throughout our community the chance to experience world-class opera in this unique and relaxed setting,” remarked Mary M. Jalonick, President and CEO of The Dallas Foundation. “This successful partnership has inspired our Board of Governors to pledge our continued support of these efforts through 2017.